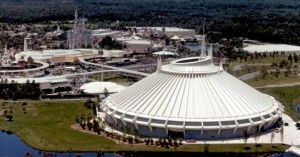 January 15, 1975: Space Mountain officially opens at Disney World’s Magic Kingdom. The Space Mountain concept was a descendant of the first Disney “mountain” attraction, the Matterhorn Bobsleds at Disneyland, which opened in 1959. The Matterhorn’s success had convinced Walt Disney that thrilling rides did have a place in his park. 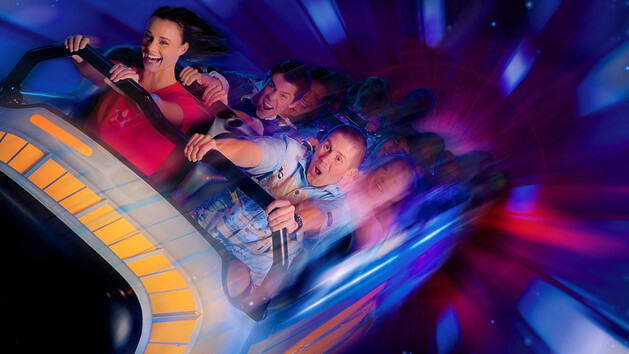 Space Mountain is the oldest operating roller coaster in the state of Florida. 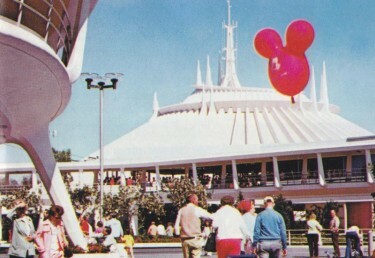 From 1975 to 1993, Space Mountain was sponsored by RCA. From the ride’s debut until 1985, the entrance and exit building had overhead speakers playing the big band and orchestral portion of RCA’s song “Here’s to the Future and You”. Guests Must Be 44in (112cm) or taller. During conceptualization, the attraction’s name was “Space Voyage”. Space Mountain has 30 trains, 15 for each track, though only 13 are usually in operation at any given time. Hurtle through the cosmos to the edge of the galaxy and back! Navigate a shadowy, neon-lit space station and make your way to a bustling Control Tower, passing a constellation of glowing astronaut training stations along the way. Inside a futuristic launch pad, board a sleek rocket-shaped vehicle and prepare yourself for a high-flying adventure into deep space. When all systems are “Go,” glide through an energy tunnel pulsating with blinking lights and ascend a 180-foot high mountain. At the top, launch into the remote blackness of the dark universe, the mysterious sounds of space and galactic music filling the void. Whiz past shooting stars and celestial satellites during your thrilling space ride. Behold streaking orbs of light, wayward comets and migrant meteors. Dip and careen into the inky blackness as futuristic Starry-O-Phonic Sounds echo all around you. Feel the push and pull of gravity as you soar into a swirling wormhole for re-entry—an unforgettable first flight in space successfully completed!